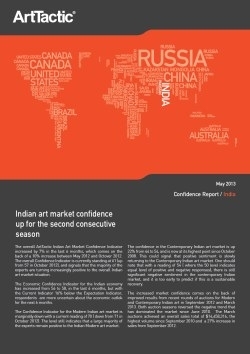 The overall ArtTactic Indian Art Market Confidence Indicator increased by 7% in the last 6 months, which comes on the back of a 10% increase between May 2012 and October 2012. The overall Confidence Indicator is currently standing at 61 (up from 57 in October 2012), and signals that the majority of the experts are turning increasingly positive to the overall Indian art market situation. The Confidence Indicator for the Modern Indian art market is marginally down with a current reading of 70 ( down from 71 in October 2012). The level still indicates that a large majority of the experts remain positive to the Indian Modern art market. The confidence in the Contemporary Indian art market is up 22% from 44 to 54, and is now at its highest point since October 2008. This could signal that positive sentiment is slowly returning to the Contemporary Indian art market. One should note that with a reading of 54 ( where the 50 level indicates equal level of positive and negative responses), there is still significant negative sentiment in the contemporary Indian market, and it is too early to say if this is a sustainable recovery. The increased market confidence comes on the back of improved results from recent rounds of auctions for Modern and Contemporary Indian art in September 2012 and March 2013. Both auction seasons reversed the negative trend that has dominated the market since June 2010. The March auctions achieved an overall sales total of $14,458,316, the highest volume since September 2010 and a 27% increase in sales from September 2012.